A mechanical failure thwarted Calgary endurance athlete Greg Kolodziejzyk's human-powered nautical circumnavigation of Vancouver Island Oct. 31st. "When you attempt something that has never been done before, you are going to be learning a lot from trial and error," said Kolodziejzyk. "I'm very happy that we were able to 'learn' about this problem with the gear box before my Hawaii crossing!" Crucial drive train components failed near Buckley Bay, 3.5 hours and roughly 17 kilometres after launching from the Comox (BC) Harbour. Kolodziejzyk and his partner in the record attempt, trans-Atlantic rowing veteran Jordan Hansen, were unable to make onboard repairs, forcing a premature end to the ambitious pedal-powered voyage. "We were running out of time (for the Vancouver Island attempt) and I made some assumptions about our mechanical equipment," explains Greg. 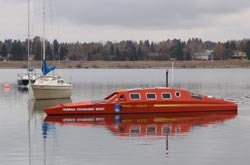 "It took us twice as long to build this state of the art human powered boat as expected and while it was always my plan to thoroughly test this boat on Glenmore reservoir here in Calgary before setting out for sea trials on Vancouver island, we didn't finish WiTHiN until late in October. Most lakes around here start freezing up in November, so we sort of rushed the sea trials without properly testing the drive leg out on a lake here at home first." The Vancouver Island circumnavigation was Kolodziejzyk's first chance to put his boat to the test in ocean conditions and an opportunity to prepare for an even more ambitious journey, called Pedal The Ocean - a solo Pacific crossing from Victoria to Hawaii, currently planned for June 2010. Greg says the drive leg problem is now solved and his team is busy building a spare unit to take in the boat during their next attempt at sea trials. He plans to bring Within back to Vancouver Island in January, for further testing in the Georgia Strait. "I learned a TON on this trip," says Greg. "Within, designed by award-winning naval architect Stuart Bloomfield cruises along at an easy 4 knots - about as fast as a small sail boat. It is stable and fully enclosed for protection against the harsh ocean environment. It's also very comfortable and easy to maneuver. I spent a night in the sleeping cabin and it is very cozy. I finally got a chance to experience what it is like to live and travel in this incredible machine and I can't wait to do it again."